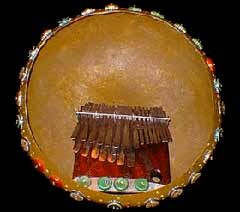 The mbira dza vadzimu in a fiberglass resonator (deze). This is another type of mbira specific to the Shona People of Zimbabwe (Rhodesia). The instrument is secured inside the resonator with a small soundpost and is plucked with the thumbs of both hands with the higher pitched keys on the right plucked from underneath by the index finger.